Air-O-Car offers personalised parking at affordable rates. Whether you are travelling for business or pleasure we have the airport parking solution for you. Simply make a reservation and arrive at the relevant airport departure terminal building where an Air-O-Car representative will collect and transfer your vehicle to our safe and secure compound. Our facility is the only option perfect for corporate and frequent flyers. Corporate parking lends greater convenience at reduced rates. This advantage is convenient and there is no need to search endlessly and fruitlessly for parking space, nor have you to wait in long rows to pay afterwards. Shuttle services are available from OR Tambo or any other point within the Gauteng borders. Leave your car with us and enjoy a stress free flight with great confidence and first class experience! Once you plan your trip, arrange for a collection at either airports and we will park you car at our secure warehouse until your arrival. Guaranteed secure parking with affordable parking rates. Get a complimentary car wash, dry and vacuum on the day of your arrival. Our pricing structure is based on a sliding scale, meaning the longer your vehicle is stored with us, the less it costs per day. 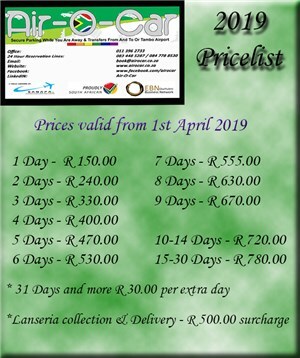 The pricing structure is calculated per calendar day and includes VAT as well as a free complimentary car wash, dry and vacuum on your return. . Designed by I Need IT.